Absolutely love this pillow. The cover is so soft. I like that it is washable, and the foam doesn't give off an oder that some do. Great for reflux, post nasal drip, also very comfortable and right height for sleeping after a hectic day. 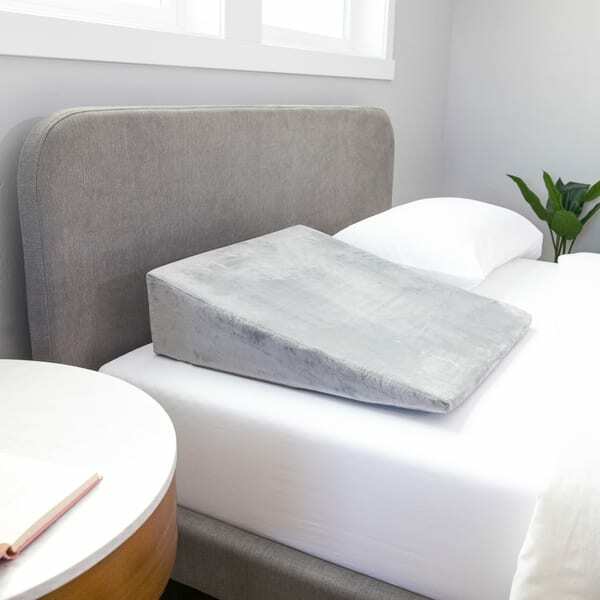 Add extra support to your bed with this Linenspa Foam Wedge Pillow for a great night's sleep. This wedge pillow is angled to provide comfort and support while also conforming to your shape to reduce pressure points. This pillow has a soft grey minky cover on it. I’ve been using it to take some pressure off my back at night and love it. My kids have been using it as a back prop against the wall and to climb in and it hasn’t broken down at all. It came vacuum sealed and took a while to fully expand. No strange odors from cheap foam at all. Quality product. This wedge pillow is great for sitting in bed reading. It has just the right angle to sit and have my back supported. The pillow angle goes from about 7” to about 1”. It is well made and comes with a removeable washable cover. The cover is very soft velour material that has a zippered closure. The foam is nice and firm. Another quality product from a great company! The wedge is wider and lower than I expected, but it is actually perfect. When I used it I experienced no discomfort from the height nor blood flow. I also was able to move without falling off of the sides of it. Firm and comfortable, it has helped to alleviate some back pain I have been having. It also makes a nice back pillow to sit against the wall or headboard with. I love how versatile this wedge pillow is! It goes from a very small incline and gradually gets up to a few inches of incline. The pillow is large, like two feet by two feet which is great because I use it a lot to rest my back against, especially when reading in bed. You can also use it to prop your knees up or as a wedge so that you don't roll over. This is a great pillow to have. The cover is a soft, velvet like feel and can be removed and washed. I got this because the doctor suggested trying out a wedge pillow to ease acid-reflux symptoms. The wedge comes as a roll wrapped in heavy clear plastic. However, when you remove the plastic you can see it begin to enlarge and take shape. After an hour, it was pretty much ready for use.It took me about 2-3 days to get used to it, but now I actually enjoy sleeping on it.The reflux symptoms have reduced too. This wedge pillow is perfect for a slight angled lift. Its got a nice firmness to it ans doesnt sink in when you lay on it. We use ours in the living room for movie night, much easier then pillows and super comfy. The oouter velour cover is secured with a zipper, it easily comes off for cleaning and its easy to put back on. Males movie nights laying on the floor more comfortable for us. I threw out my back a few weeks ago. In order to sit comfortably, I needed some support in my lower and upper back area. Regular pillows weren’t cutting it! My kids used a wedge pillow when they were small for reflux and I remember using it to ease my back when they were older-we’d gotten rid of the ones we had, so I bought this one! It’s so soft, and meshes so well to my back, it’s the perfect support. My kids have already tried to claim it-my son used to to stay upright when he couldn’t breath well from bronchitis...we’ve all gotten a lot of use of it! This is a perfect pillow to gently prop you up in bed either with additional pillows to sit up in bed to read or watch tv, or alone or with one pillow to sleep a little elevated for indigestion. I can also imagine it would have been nice when i was pregnant to lean up against on my side. When you get it in the mail though, I would warn anyone to not pan to use it immediately. First of all it is recommended that you wash the cover before use. Additionally it will take overnight in my case for the pillow to unravel and inflate itself for lack of a better word. It will come super compressed and rolled up and it needs time to regain it's shape. My babies both have really bad congestion die to being premature and we are dealing with reflux when they are on their backs. This pillow is a life saver with a slight inclined to keep their food in their tummies. I like the firmness that still allows some give so I don't have to worry about them melting into the pillow. Easy to remove cover to allow for quick washing. This pillow is extremely comfortable. I really like the angle that it allows me to sleep on. The cover is very soft and can be removed to be wash. I think that it holds the shape well. When it arrived I did have to let it expand for a little while from shipping then it was ready to use. Overall I am very happy with my purchase. Got this to try and stop snoring. Apparently I snore according to my husband and it bothers him. Been using for a week and hubby says I'm hardly snoring. I do feel more rested so it's obviously helping! I bought my pillow to elevate my head to help with a couple of health issues and I love it. I opened the package and started using it immediately.its firm without being too rigid. The washable, removable cover makes it extra nice!Plush and comfortable. I got this for my honey because of his acid reflux. The angle of sleep that this pillow allows keeps him asleep all night without worry that that sudden surge of bile rushing up your throat is does not happen. I find all foam rubber to be pricier than I think it should be, the wedge is no exception. It did arrive fast and performs perfectly. Overall I'm happy. This is great for sleeping slightly raised. Add a pillow or two and you are all set for a good read. I put a padded cover on mine and it's more comfortable. Glad I bought it. I really like this and helped me a lot with my heartburn. And with my sleep apnea. Do some of my snoring. The reason for the four star is because I feel is a bit uncomfortable on my lower back. I really like to a help me a lot with my heartburn. And with my keypad now it will do some of my snoring. The reason for the four star is because I feel is a bit uncomfortable on my lower back. But I guess just trust me. Maybe it takes some getting use to. This wedge pillow does help my breathing at night but is kind of unwieldy and hard to store. Cover is good and can be washed but is hard to get back on the wedge. I already had a wedge pillow but this one is perfect. I am a short person and this fits me a lot better than the 7" one that I have. Plus the length is perfect. "What degree angle is this?" needed per doctor to help with gerd. The price and it has a removable washable cover.